The high resolution research tomograph (HRRT, CTI/Siemens) scanner is developed by CTI (later Siemens Medical Solutions) as a dedicated brain scanner for research, and it has been delivered only to selected centers worldwide. Its design features enable high image spatial resolution (NEMA standard FBP reconstruction ~2.4 mm). 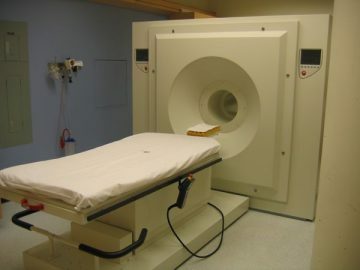 To this day, the spatial resolution of the HRRT is still unrivaled among all commercially available human scanners, and the scanner is especially suitable to image small structures within the brain. This very high spatial sampling has been achieved by incorporating quadrant sharing and depth-of-interaction detector technology as well as small detector crystal size (2.1 x 2.1 x 10 mm3). The scanner consists of octagonal rings of LSO and LYSO detectors to provide depth of interaction information and renders fairly isotropic spatial resolution throughout the imaging field of view (FOV). The axial length of the imaging FOV of the scanner is 25.2 cm and radial (transaxial) FOV is 31.2 cm. This FOV and the wide bore opening (35 cm) enables imaging of the entire human brain. Attenuation correction required for quantitative imaging is generated using rapid transmission scan in singles mode with a 137Cs point source. Data are collected in list-mode for maximum flexibility regarding post scanning data processing of dynamic studies. Collaborators wishing to conduct a study are encouraged to read our research section and our page on how to start a new study.